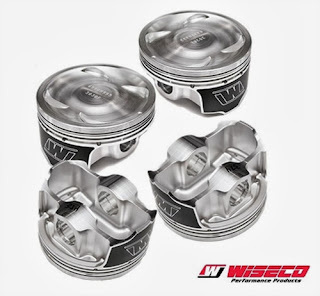 Wiseco has built pistons for most major forms of motorsports, from off-road to rally, Formula 1 to drag racing. So, their pistons benefit from some heavy-duty engineering experience. For maximum strength, they're forged from either 2168 or 4032 aluminum alloy, and then precision CNC-machined to their intricate final configurations under close tolerances. Where applicable, designs incorporate strength provisions to deal with turbocharging, supercharging, and nitrous. chromoly wrist pins and Spirolox retainers are included.